MIHM is recognized by Maharashtra State Board of Vocational Education, a state government body recognizes these courses for one to secure good roles in hospitality sector as well as enhancing skill sets to be a future entrepreneur. Balanced Curriculum – MIHM offers hospitality-focused programs that combine experiential learning and internship experiences with management theory. This approach allows students to apply their theoretical knowledge in the professional settings of hospitality establishments. 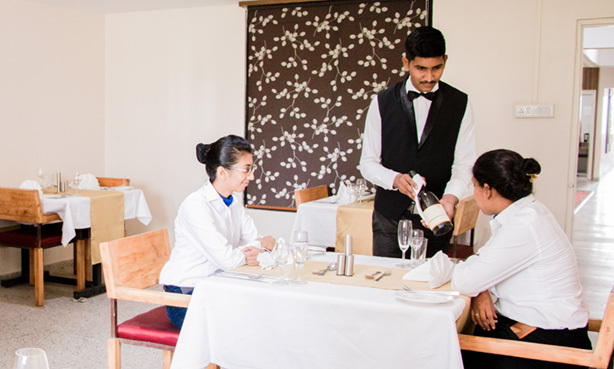 Placements – being part of a large hospitality group and home to more than 500 in house employees placed in various operational units, students have an opportunity to choose the field of their choice from it Kitchen, F & B service, Housekeeping or Front Office. We offer a wide range of Hospitality programs to choose from. Whether you are interested to pursue career in tourism, travel, culinary, events or service organizations, we will imbibe in you the leadership qualities and business skills to work in any modern company. Undergraduate programs – if you are not sure what is the right path, or you are tired of traditional teaching, this is your chance to try something different. Our undergraduate programs lets you gain hands-on experience and multicultural perspectives with professional internships. If you are planning a career as a chef, working in a kitchen will teach you how to handle hot and stressful situations as you gain knowledge about all the operational processes of a food and beverage establishment. It is important to understand every job in hospitality before you can learn how to manage a team. You will work in all of our restaurants on campus – from formal dining to fast food – giving you a variety of experiences. To understand great service, it is critical to learn the art of making guests feel welcome. Our rooms division classes let you simulate the role of a Executive House keeper. At the heart of every program is an academic education. MIHM prides itself on offering comprehensive, quality programs that combine rigorous academic study with hands-on leadership and business mentoring by experienced faculty.